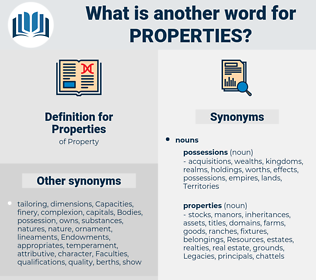 What is another word for Properties? 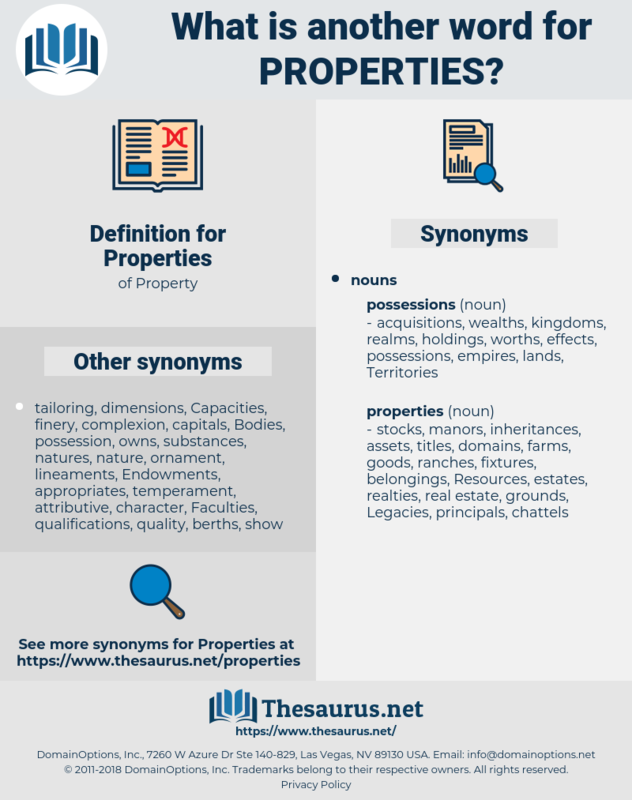 belongings, Peculiarities, landholdings, homesteads, characteristics, estates. conditions, monuments, interests, services, themes, funds, blocks, Industries, hallmarks, accounts, products, attributes, specifications, requirements, holdings, features. profit, props, products, tower, characterization, profile, attribute, attributes, Qualities, specification, specifications, components, articles, character, nature, requirements, WEBSITES, elements, local, pattern, HPD, flat, data, aspects, holdings, venue, venues, feature, features, typical, unesco, fiscal, proprietary, propiedad. responsibilities, priorities, years, accommodations, Equities, proceeds, Particularities, operations, apartments, mortgages, circumstances, projects, Identities, stores, liabilities, specificities, Operators, owners, Pharmacodynamics, factors, constructions, Entities, Commodities, hotels, portions, enterprises, residences, plantations, portfolios, lots, Households, Realities, profiles, terres, high-rises, promotion, stocks, damages, Cities, conditions, parcels, values, purchases, landlords, specifics, tenants, acquisitions, earths, materials, quality, exports, tangibles, sectors, shelters, tenements, homes, Capabilities, structures, types, Necessities, Capacities, Areas, parameters, courses, receipts, qualifications, treasures, ranches, ORES, amenities, fortunes, rooms, earnings, farms, terranes, Territories, consequences, papers, Virtues, settlements, homeowners, locations, respects, landowners, fields, details, utilities, Activities, Records, spaces, developments, Negotiations, effects, deeds, particulars, interests, surveyors, documents, implications, plots, quarters, lodgings, contents, traditional, roads, containers, Criteria, Abilities, paraphernalia, dwellings, Artefacts, services, dependants, explosives, Characters, grounds, topics, Soils, installations, offences, dimensions, means, metres, dispersed, costs, Governments, settings, bienes, powers, traits, Vehicles, natures, ingredients, Artifacts, Stories, playgrounds, endpoints, finances, Publications, biens, Families, relics, advancement, benefits, yards, Resumed, Dependencies, institutions, sales, revenues, specs, terrains, pollutants, substances, devices, establishments, campgrounds, Fees, Firms, dependents, performances, donations, Legacies, merits, hostages, sexual, Plants, complexes, funds, total, shares, meters, fine, variations, blocks, outlets, suppliers, instalments, compounds, Feet, nice, patterns, SQS, marks, Charges, hands, Industries, trends, inputs, Ones, okay, valuables, genres, expenses, Businesses, supplies, variables, skills, vessels, Schools, Arenas, highlights, functions, hallmarks, loads, wares, sanctions, grades, IMPACTS, Animals, Ships, covers, claims, MINES, Forms, Subsidiaries, Drugs, Genera, kinds, Gains, accounts, figures, M, units, products, attributes, Qualities, specifications, components, articles, shops, requirements, WEBSITES, elements, data, aspects, holdings, venues, features. ownership, shop, shops, items, estate, estates, asset. Now, in both cases, in the instinct of the animal and in the vital properties of the cell, the same knowledge and the same ignorance are shown. What are thy properties and treasure?